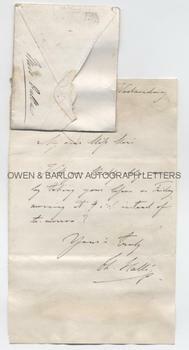 SIR CHARLES HALLE autograph Letter Signed. German born British pianist and musical conductor. Founder of the Halle Orchestra. ALS. 1p with original envelope. No place. 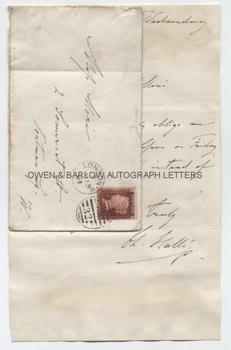 Wednesday, no month or year but envelope is postmarked London 1868 and the letter paper has an 1868 watermark. To Miss Mori. "Will you kindly oblige me by taking your lesson on Friday morning at 9 o'clock instead of tomorrow?" 8vo. Approx 7 x 4.5 inches. Lacking integral blank leaf and with mounting residue to verso. 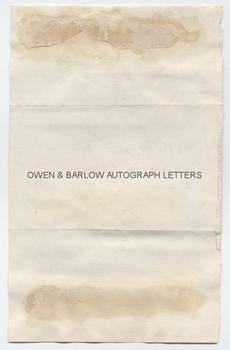 The envelope is tipped onto the head of the letter. Very good. Sir Charles Halle had a strong influence on musical education in England in the 19th century and it was largely due to him that emphasis was placed on technical precision and fidelity to the written score, rather than on individual interpretation. His recitals were an important event in London society. It appears from this letter that he was giving lessons to one of the daughters of the Italian virtuoso violinist, Nicolas Mori (1796-1839), who had been regarded as the best violinist of his generation until he was somewhat overshadowed by Paganini.